A "wrapper" Egypt page with links to the various Ptolemies' individual pages so you can add just this one link if you prefer that to the several links by ruler (see individual ruler entries for direct access by ruler). The WildWinds website has been created as a reference, attribution and valuation resource in the field of ancient numismatics. The data presented were, for the most part, gleaned from closed online auctions, so one can see for each coin the original auction description, the auction's closing date and time, and the closing price. Since these sources for the information vary from the very experienced dealer to the beginner selling something for the first time, there is no guarantee that any given attribution or description presented here is entirely accurate. Furthermore, the closing prices for all auctions vary greatly, so any valuation you determine here should not be taken as a definitive answer. All of the pictures and descriptions here remain the property of the original sellers. You must obtain permission to re-use them in any form. Bearers of Meaning: The Ottilia Buerger Collection of Ancient and Byzantine Coins at the Wriston Art Center Galleries, Lawrence University, 7 Apr - 21 May, 1995. This web site was created in conjunction with an exhibition entitled Bearers of Meaning: The Ottilia Buerger Collection of Ancient and Byzantine Coins at the Wriston Art Center Galleries, Lawrence University, 7 Apr - 21 May, 1995. An excellent stroll through some of the features of Ptolemaic coins. Although this page is only a sketch of the world of Ptolemaic numismatics overall Mr. Smith's web site is a must, must, must! for all numismatists, especially those starting out. The Archaeology 201 Home Page area is meant to be a medium through which relevant course materials are made available to students in a convenient fashion. Divided into sections which reflect those listed on the course syllabus the pages on the Ptolemies present selected images from the lectures on Egypt and the Ptolemaic Dynasty, which have been divided into topics including Ptolemaic Coinage. This page presents 5 color images including several rare masterpieces of numismatic art. [one minor error here - a Lysimachus coin is below the two central Ptolemaic gold coins]. Site keepers: Professor Higginbotham or Ryan Dunn of Bowdoin College, Brunswick, Maine. The base page is at URL http://www.bowdoin.edu/dept/clas/arch201/. Only passing mention of some Ptolemaic coins found. Click here for full report. Did you want your own piece of history in the palm of your hands? This is one commercial coin dealer's listings (Forvm Ancient Coins) of coins already sold and still for sale. In Egypt and Syria there was a different response to the dwindling supply of the popular Athenian tetradrachms. The originals were sometimes imitated very closely. This is part of a very detailed numismatic web site called PRESVEIS: One Currency for Europe. Common coinage from Antiquity to the Modern Age (at URL http://www.culture.gr/nm/presveis/ ). Prepared by the Athens Numismatic Museum (Greece) and the Department of Coins and Medals of the British Museum, London (UK), the project seeks to bring the public in touch with the coinage issued by three major city-states of Hellenic antiquity: Aegina, Corinth and Athens. The WildWinds website has been created as a reference, attribution and valuation resource in the field of ancient numismatics. The data presented were, for the most part, gleaned from closed online auctions, so one can see for each coin the original auction description, the auction's closing date and time, and the closing price. (For more on WildWinds see the GENERAL section above). by Martin A. Armstrong, © Princeton Economic Institute (Last Update 11/01/96). Although part of a commercial site, this set of interwoven links provides a good overview with ample high-quality illustrations and covers the entire range of the Ptolemaic Dynasty including the related issues of Marc Antony with Cleopatra VII. AR tetradrachm, c. 305-283 BCE, 14.31 g.
(Cambridge 1991) pages 63-66. From Bearers of Meaning: The Ottilia Buerger Collection of Ancient and Byzantine Coins at the Wriston Art Center Galleries, Lawrence University, 7 Apr - 21 May, 1995. AV pentadrachm, c. 285-246 BCE, 17.81 g. Ex-Bank Leu, 1973.
see: J. Svoronos, Ta Nomismata tou Kratous ton Polemaion, vol 2 (Athens 1904) 712, pl. 21.1. From Bearers of Meaning: The Ottilia Buerger Collection of Ancient and Byzantine Coins at the Wriston Art Center Galleries, Lawrence University, 7 Apr - 21 May, 1995. AV octodrachm, 260s BCE, 27.79 g.
see: H. Troxell, Arsinoë's Non-era , American Numismatic Society Museum Notes 28 (1983) 60-62; O. Mørkholm, Early Hellenistic Coinage from the Accession of Alexander to the Peace of Apamea (336-188 B.C.) (Cambridge 1991). From Bearers of Meaning: The Ottilia Buerger Collection of Ancient and Byzantine Coins at the Wriston Art Center Galleries, Lawrence University, 7 Apr - 21 May, 1995. Image of a coin minted around 310 BCE, thirteen years after the death of Alexander. It was minted in Alexandria under the rule of Ptolemy, Alexander's most trusted general, and childhood friend. Part of a sparse site honoring Alexander the Great. O. Mørkholm, Early Hellenistic Coinage from the Accession of Alexander to the Peace of Apamea (336-188 BC) (Cambridge 1991). From Bearers of Meaning: The Ottilia Buerger Collection of Ancient and Byzantine Coins at the Wriston Art Center Galleries, Lawrence University, 7 Apr - 21 May, 1995. Provides an image of one of the Ptolemaic 'YHDH' coins Ca. 260 BCE. Silver hemiobol struck by the local authorities in Jerusalem under Ptolemy II, depicting the king's head and an eagle with the Hebrew inscription YHDH (Judea). © All rights reserved by The Museon Israel, Jerusalem 1996. AV octodrachm, c. 246-221 BCE, 27.81 g.
O. Mørkholm, Early Hellenistic Coinage from the Accession of Alexander to the Peace of Apamea (336-188 BC) (Cambridge 1991) 106. From Bearers of Meaning: The Ottilia Buerger Collection of Ancient and Byzantine Coins at the Wriston Art Center Galleries, Lawrence University, 7 Apr - 21 May, 1995. By noted numismatic dealer Harlan J. Berk. A short paragraph on these stupendous coins. AV octodrachm, c. 221-205 BCE, 27.82 g.
O. Mørkholm, Early Hellenistic Coinage from the Accession of Alexander to the Peace of Apamea (336-188 BC) (Cambridge 1991) 108-109. From Bearers of Meaning: The Ottilia Buerger Collection of Ancient and Byzantine Coins at the Wriston Art Center Galleries, Lawrence University, 7 Apr - 21 May, 1995. No coins illustrated, only a listing of denominations in use under this ruler. Although part of a commercial site, this set of interwoven links provides a good overview with ample high-quality illustrations and covers the entire range of the Ptolemaic Dynasty including the related issues of Marc Antony with Cleopatra VII. Image from the webauthor's collection. Image © A. Philippidis. Exceedingly rare. Only the sixth example (of seven) known, five others in museum collections, two -- including this -- in private hands. Note: The reign of Ptolemy XI was so brief (about 20 days), no coinage has been clearly identified as being minted during his administration. By Luigi Pedroni (Napoli). From Pomerium vol. 3/1998 (ISSN 0945-2354) - In Italian. Investigates when and which Ptolemy left his inheritance to Rome and any numismatic evidence in Roman Republican Coinage. Available as a PDF file. This rare silver tetradrachm is believed by numismatic scholars to have been struck sometime between 36 and 34 BCE, most likely at a mint in Syria where they often Summered. See also http://www.ocf.berkeley.edu/~pavel/egypt.html for the obverse. This page takes the time to explain the devices found on the reverse of later Ptolemaic tetardrachms. One minor error: the attibution of a quote to "Kirk and Bentley", which was due to Richard Hazaard. K&B are the publishers of his book (see Bibliographic Notes below). --- Coin of Cleopatra from Coins from Famous People in History site. The authors asks:" Ever wonder what a coin looked like that was issued by Julius Caesar? How about a coin from Napoleon? or Cleopatra? or Genghis Khan?" You can see coins from these and other famous historical figures at this site. A Legionay denarius of Mark Antony is also illustrated. From a Roman denarius minted by Marc Antony. His head graces the coin's other side. The legend names Cleopatra as "Queen over kings" -- this was thought rather scandalous at the time. This is part of the larger Chronology of Roman History site. Caesar, Mark Antony, Legionary Coinage of Mark Antony, also Juba II, son-in-law of Marc Antony & Cleopatra (married Cleopatra Selene), as well as other related series of coins. From Dave Garstang's Those Wacky Emperors, 49 BCE - 305 CE, a somewhat irreverent survey of fifty-one men, from Julius Caesar through Diocletian, who held supreme power in the empire that owned the entire Mediterranean Sea for four hundred years. From Barry & Darling Newsletter # 1. A review of the so-called Legionary denarii produced by Mark Antony and used to pay his troops about the time of the battle of Actium. Barry & Darling are commercial coin merchants. A selection of the coins of Mark Antony. From the Virtual Catalog of Roman Coins, web site maintained by Robert W. Cape, Jr, Austin College. 41 BCE, Fourree denarius (Cohen 8, BMC 103). Obv. Legend: M ANT IMP AVG IIIVIR RPC M BARBAT Q P. Antony head right. Rev. Legend: CAESAR IMP PONT IIIVIR RPC. Octavian head right. Coin issued during the short truce between Antony and Octavian following the death of Julius Caesar. This denarius celebrates the successful conclusion of Octavian's Egyptian campaign. In 29 BCE Octavian returned to Rome for his official triumph (a triple one, primarily celebrating his successes at Actium and Alexandria but also in Illyricum), and in the following year the crocodile with the inscription AEGVPTO CAPTA celebrated the event on these denarii, probably struck at Rome. From Bearers of Meaning: The Ottilia Buerger Collection of Ancient and Byzantine Coins at the Wriston Art Center Galleries, Lawrence University, 7 Apr - 21 May, 1995. Both the obverse and reverse of this coin feature types referring to Octavian's victory over Antony and Kleopatra. Victoria on a ship's prow on the obverse refers to naval victory, specifically Octavian's defeat of Antony's fleet in the Battle of Actium. But the depiction of Octavian in a triumphal quadriga on the reverse indicates that the coin actually dates from his triple triumph (for his victories in Illyricum and Egypt, as well as in the battle of Actium) in Rome in 29 BCE, when the Senate conferred numerous honors upon him. From Bearers of Meaning: The Ottilia Buerger Collection of Ancient and Byzantine Coins at the Wriston Art Center Galleries, Lawrence University, 7 Apr - 21 May, 1995. Ta Nomismata Tou Kratous Ton Ptolemaion (Athens, © 1904-1908) in four volumes. Although somewhat out of date in places, this remains the most complete, definitive, standard reference for these coins. The main sections (Greek volumes 1-3 of the catalog with plates) are now available online via Ed Waddell's web site in an ENGLISH TRANSLATION by Cathy Lorber. Until Ms Lorber's planned revision of the catalog of Ptolemaic coinage -- due out early in the next millenium -- this is the place to reference your Ptolemaic coins. (Thank you Ed and Cathy). "Though it approaches its centenary, Svoronos remains the preferred reference for Ptolemaic coinage. The catalogue offers remarkably comprehensive coverage. The new varieties that I have been able to add amount to no more than 10–15% of the total, and most of these are minor variants or missing denominations from a well-documented series. ... Indeed, Svoronos cast his nets so wide that he caught up some coinages that were Ptolemaic in sentiment, but issued by non-Ptolemaic authorities. Still other entries do not belong at all in a catalogue devoted to the Ptolemies. Of greater concern, Svoronos cannot always be relied upon for the accuracy of his classifications. Mint attributions are frequently wrong, reign attributions sometimes so; and bronzes may be wrongly associated with one another. Svoronos imagined dating systems in the early Ptolemaic coinage of Alexandria where they did not in fact exist. Appended is a bibliography listing the principal works where these errors are corrected. A quick perusal of the annotations should alert the user when to be skeptical." ... The preceding list of caveats is demanded by conscience, but should not be understood as denigrating Svoronos. His was a monumental achievement that stands to this day, merely broidered round the edges by subsequent scholarship. The coverage is extensive and the research is very good. The SNG format volume measures 12" x 15"
Paphos I: A Ptolemaic Coin Hoard (1976) 125 pp + 22 plates. but you can try to place an order for this book from Amazon.com. Should a copy become available you will be contacted directly. Catalog from an auction of a specialized collection of Ptolemaic & Roman Egyptian coins held in Köln, Germany on 12 Nov 1984. 1,389 lots (of which only 78 are Ptolemaic), with an excellent selection of items, all expertly catalogued and most of them illustrated on the same page as their descriptions. 143 pages, cardcover. Some Cypriot "Alexanders" (Chicago, 1974 reprint of Numismatic Chronicle , (1915) pp.294-322 & pl. XII-XV). Two Hoards of Ptolemaic Silver: IGCH 1713 and 1722. I: The Sharnub hoard and the Crisis of 89/8 B.C. II: IGCH 1722 and the great debasement of 53/2 B.C. Author: Yigal Ronen. Each of the article's pages have been scanned as GIF files. The most recent article on the subject, the author maintains that the early YHD coins of the persian period are really based on the weight of the First Temple Shekel. Many of them are 1/24th of a shekel in weight and thus termed a gerah. The YHD coins in the Ptolemaic period see a return to the Athenian standard. The intention here is to provide an overview sense of Roman coins struck in Egypt. None of the coins here are available for sale. Since they do illustrate imperial and religious themes utilizing the changing artistic values of the periods covered, I consider these to be among the most fascinating issues of the Empire. The few examples shown here are not representative of the whole series ... they are highly interesting. 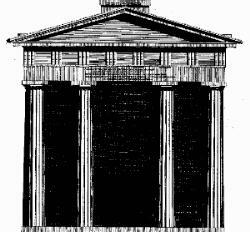 Provides contemporaneous depiction of one of the great architectural wonders of the ancient world. By Jeremy Haag (21 Sep 1999). A one-page description of coinage while Egypt was part of the Roman Empire. --- Roman Family Portraits: Antoninus Pius, Marcus Aurelius, Faustina the younger. A tetradrachm from Egypt of Antoninus Pius (with a very unusual wreath of grain) and his son-in-law Marcus Aurelius struck year 7 of Pius. Another showing Faustina (from Bruce Raplee's web pages). Michael Mihalka's online collection of Gordian III coins is large and worth a look. His 22 Alexandrian coins of Gordian feature two that are not listed in Geissen's catalog. Covers Carus, Numerian, and Carinus. From Dave Garstang's Those Wacky Emperors, 49 BCE - 305 CE, a somewhat irreverent survey of fifty-one men, from Julius Caesar through Diocletian, who held supreme power in the empire that owned the entire Mediterranean Sea for four hundred years. From ORB -- Online Resource Book for Medieval Studies -- a cooperative effort on the part of scholars to establish an online textbook source for medieval studies. DIE MUENZEN DER ROEMISCHEN KAISER IN ALEXANDRIEN: Historisches Museum Frankurt am Main. This work is part of the cnet Internet Coin Project for Recording Unique or Otherwise Unpublished Numismatic Items. New York, 1990. Much expanded reprint edition, includes a supplement of five auction-catalogues with prices. 425 pp, over 1,200 photographs. Over 6000 coins from Augustus through Domitius Domitianus are published. Many of these coins are now part of the Kelsey Museum (Univ. Michigan) collection. --- Förschner, G: Die Muenzen Der Roemischen Kaiser In Alexandrien: Historisches Museum Frankurt am Main. (Frankfurt, 1988). Covers the coins of Roman Egypt in the History Museum of Frankurt am Main, Germany. 1400 objects cataloged, including Greco-Roman lead and glass tokens as well as the so-called Nome coinage. Papyrologia Coloniensia 5. (Cologne, 1974-1983) in five volumes. --- Milne, James Grafton: Catalogue of Alexandrian Coins, University of Oxford, Ashmolean Museum. The city of Karanis was an ancient Greek/Egyptian settlement which in ancient times used to be on the banks of the large oasis at Fayuum (outside modern Cairo) in Egypt. It was opposite a city called Crocadilopolis and was in the area where the famous Fayuum painted mummy portraits came from. The ruins of Karanis are still there. If you visit Cairo, you can drive there in 2 hours and walk over the site for yourself. There is one small museum, but the rest of the site is largely just sand dunes and ruins today. However, for eleven years, between 1924 and 1935, archaeologists and students from the University of Michigan and its Kelsey Museum of Archaeology excavated at Karanis. They discovered over 30,000 coins! These coins ranged from Ptolemaic bronze coins of the 2nd Century BCE., to Roman imperial issues of Diocletian in the late third century CE, and afterward. This is a hard to find out-of-print University of Michigan excavation publication on the coins found at Karanis (over 400 pages). There is no other padding in this book. It just deals with the coins found at the excavation, with pictures and detailed coin descriptions - catalog numbers, references, types, sizes, descriptions of hoards, descriptions of where they were found - including hoards hidden in house walls and under steps. Karanis was memorable for the number of hoards discovered on the site. One building alone produced several dozen different hoards. The coins found at Karanis are like a microcosm of all the coin types discovered at ancient sites in Egypt. Highlighted by the Most Complete Offering of the "Labors of Hercules", Coins of The Zodiac and Nomes . Joseph-Francois Tochon D'Annecy (1772-1820) was an avid antiquarian and numismatist, amassing a noted collection which he presented to the government. This posthumously published work was an attempt to document all the coins minted in ancient Egypt. 7.5"x10", xvi + 256 pages, portrait frontispiece and many text engravings. A selection of the coins of Mark Antony. From the Virtual Catalog of Roman Coins, web site maintained by Robert W. Cape, Jr., Austin College. A GREAT site! The Perseus Project has announced the second illustrated Web catalog produced in conjunction with Boston's Museum of Fine Arts (MFA). This release is a catalog of over 775 ancient coins, added to the Perseus Coin Catalog. A straight list of the new additions may be accessed through the link provided at the press release page (the first URL above), or by selecting the MFA link at the second URL. The coins will also appear along with coins from other collections, images, and encyclopedia entries returned via keyword searches using the Perseus Lookup Tool. Images of the coins are offered in three resolutions, the largest at 3060x2036 pixels. Catalog entries for the coins include material, denomination, mint, region, issuing authority, actual weight, diameter, and a description of the type and legend on either side of the coin. The culmination of this phase of the collaborative project will be "an online publication of Roman art, with descriptions, pictures, and other educational resources. The publication will catalog over 1100 artworks, including sculpture, coins, jewelry, glass, gems, and pottery." Coins of Greco-Roman Alexandria in Heather Howard online coin collection. So far Nero, Trajian and Salonina are represented. A look at some of the coins of Greco-Roman Alexandria recently sold via the internet or in the author's collection (none for sale). You can see a grouping of Reverse Images, cumulative frequency tables for obverse and reverse images (based on images collected from internet sources such as eBay), and a listing of reverses describing what & who are depicted.